Mabel did her PhD in palliative nursing. After graduating, she explored dermatology and hand surgery. She finally found her true love in hand surgery. Her hobbies are playing the piano and writing romance stories. Yik Weng is an epidemiologist and specialises in atopic dermatitis. Background: Atopic dermatitis (AD) is a common chronic skin condition which has significant disease burden. Hence, it is important to understand the knowledge needs and coping of patients with AD. Materials and Methods: This study was conducted in a dermatology outpatient clinic in Singapore. Qualitative, semi-structured interviews were conducted with patients, dermatologists, dermatology nurses, and a medical social worker (MSW). A sample of patients with AD was recruited. Dermatologists and dermatology nurses who regularly worked with patients with AD were selected. Interviews were recorded and transcribed verbatim. The framework method was employed for data analysis. A total of 22 participants were recruited, comprising of eight patients with AD, eight dermatologists, five dermatology nurses, and one MSW. The main needs of patients that were identified were: knowledge about AD and coping with psychosocial aspects of the disease. Regarding knowledge about AD, patients wanted to know more about the underlying causes and management of AD. On coping with psychosocial aspects, patients expressed their appreciation for both the concern shown by their healthcare professionals and the opportunity to share their experiences. Some patients had difficulties coping with the rashes on the visible areas of their body. Conclusion: It is essential to include education surrounding AD pathophysiology and the psychosocial aspects of coping with AD during counselling of these patients. Itch management, knowledge of possible triggers, and discussion on complementary and alternative medicine should be included as components of counselling. With respect to psychosocial counselling, patients could be given strategies to cope with both the changes in appearance and the frustration associated with undesired outcomes. Atopic dermatitis (AD), also known as atopic eczema, is a common chronic skin condition prevalent in people who have a family history of atopy, including asthma, eczema, or allergic rhinitis . In the United States, the prevalence of AD has been reported to be 10.7% in children and 10.2% in adults . AD is also the most common skin disease in the Asian population [3,4]. In Singapore alone, 20.8% of children between the ages of seven and 16 have been diagnosed with AD . AD is characterised by intermittent periods of exacerbation and remission. Patients with AD have pruritic rashes, erythema, lichenified patches, and excoriations due to scratching of the skin. These symptoms often affect the patient’s sleep and mood, resulting in a decreased overall quality of life [5,6]. Due to its significant disease burden, understanding the education needs of patients is important for developing a holistic program to help patients manage their condition. From a review of the literature, the education needs of AD patients and their caregivers include disease pathophysiology, awareness of trigger factors, skin care (including application of topical creams such as steroids, moisturisers, and wet wraps), a range of treatment modalities, management of symptoms such as itch and sleep disturbances, nutritional aspects, and coping strategies [7,8]. A good education program has been found to result in a significantly lower dermatitis severity index, increased use of emollients and wet wraps, decreased use of steroids, reduced itching and irritability, and improved sleep [7,9]. It is important to understand the knowledge needs and coping mechanisms from both the patient’s and healthcare professional’s perspectives. Studies to understand the education needs of AD patients were mainly conducted in Western countries. Conducting such a study in an Asian context will enable us to tailor AD education programmes for these populations . This study aims to achieve an understanding of these issues through group interviews with patients and their multidisciplinary healthcare team. Table 1. 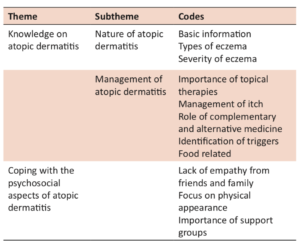 The guide used to focus the group discussions on atopic dermatitis for patients and healthcare professionals. This study was conducted in a tertiary dermatological centre in Singapore between June and December 2015 after obtaining ethical approval from the Domain Specific Review Board (DSRB) by the National Healthcare Group (NHG), study reference 2015/00236. Qualitative semi-structured interviews were conducted with AD patients and healthcare professionals. Both patients and healthcare professionals were included to obtain the perspectives from both groups, and to identify any conflicts. In a semi-structured interview, an interview guide with broad questions was used to focus the discussion (Table 1). Patients and nurses were interviewed in groups of three to five participants, while dermatologists and a medical social worker (MSW) were interviewed individually. All interviews were conducted in English, by the same primary investigator to ensure consistency. A purposive sample of patients with AD was recruited for the focus group interviews. Recruited patients had AD for at least twelve months and were all older than 21. Dermatologists and dermatology nurses, who regularly worked with patients with AD, were selected for the interviews. Patients who met the inclusion criteria and had clinic visits during the study period were recruited and written consent was obtained. Demographic data obtained from the patients included age, gender, race, level of education, occupation, smoking and drinking status, areas of skin affected by AD, age of onset, disease duration, previous treatments, and history of inpatient admission due to their skin condition. The demographic data obtained for dermatologists and nurses included age, position, number of years practicing, and academic qualifications. The focus group interviews lasted around 60 minutes, and the individual interviews lasted 20-45 minutes. Data was collected until saturation was achieved, which meant that no new information was obtained from subsequent interviews. Recorded interviews were transcribed verbatim. The framework method was employed for data analysis. Briefly, this included the analysers familiarising themselves with the interview content, coding of transcripts, and categorising the data into themes . Trustworthiness was achieved using strategies suggested by Lincoln and Guba , which included credibility, transferability, dependability, and confirmability. Credibility was achieved through triangulation and critical self-reflection. Triangulation, which was used to ensure validity through exploring multiple perspectives, was achieved through interviewing both patients and their healthcare professionals . Critical self-reflection (the reflection of one’s viewpoints) was used in data collection and analysis to reduce bias from self-imposed viewpoints . Transferability (generalisability of results) was achieved through transcription of the entire interview to provide context and meaning . Dependability (the reliability of the results) was ensured by developing an audit trail which consisted of raw data, audio recordings, products of data analysis and synthesis, and interview guides, to increase overall transparency of the research process . Finally, confirmability was achieved when the criteria of credibility, transferability, and dependability were established . The preliminary analysis was completed by a single researcher, who then presented the selected pre-codes and themes to the other team members. A total of 22 participants were recruited: eight patients with AD, eight doctors, five nurses, and one MSW. Two focus groups were conducted for the patients, and one for the nurses. There were nine face-to-face interviews with the doctors and MSW. The mean age of the patients was 30.9±7.8, and there was equal gender distribution (11 (50%) males, 11 (50%) females). AD affected numerous body regions, including the scalp (n=4, 18%), face (n=4, 18%), trunk (n=5, 23%), upper limbs (n=6, 27%), and lower limbs (n=8, 36%). The mean age of onset of AD was 13.9±12.1 years, and the mean duration since AD diagnosis was 17.0±9.1 years. Topical steroids (n=8), prednisolone (n=6), and phototherapy (n=7) were common treatments received. The mean age of the healthcare professionals was 42.1±12.2 years. The mean duration of specialisation in dermatology was 12.1±10.4 years. The main needs of patients could be broadly divided into two themes: knowledge about AD and coping with the psychosocial aspects of the disease (Table 2). Table 2. 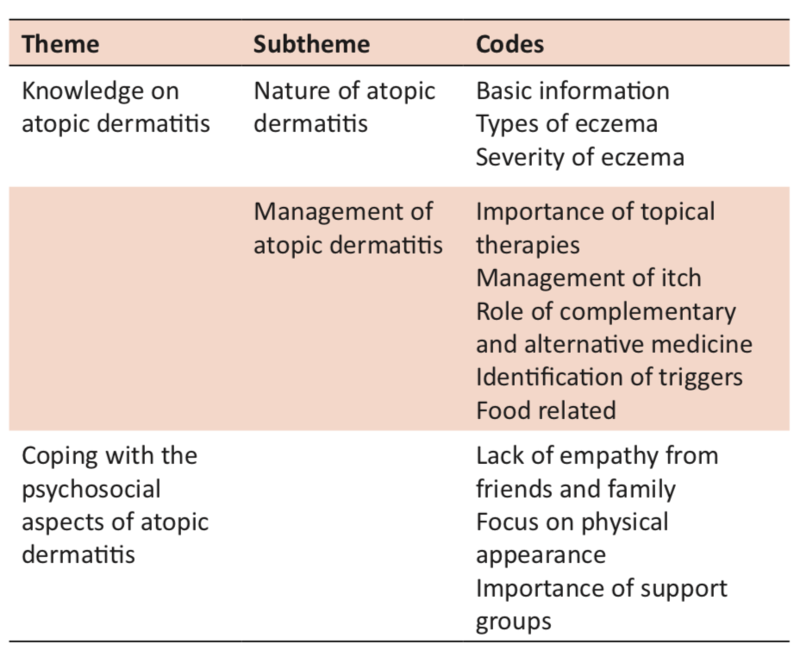 Themes, sub-themes and codes arising from the patient and healthcare professional interviews on atopic dermatitis. This theme includes the knowledge needs of patients with AD comprising the underlying pathophysiology of AD and management of the disease. Pathophysiology of ADMost healthcare professionals believed that most patients required only the most basic information on the nature of AD so as not to overwhelm them with too much information. However, some patients were interested to know the various subtypes of eczema, and important tips to help them identify the severity and status of their condition. Healthcare professionals felt that the importance of the use of moisturisers and topical steroids could not be overemphasised among patients with AD. Patients were often very concerned with their itch, and wanted better strategies to alleviate their symptoms. They were also very keen to discuss the role of complementary and alternative medicines (CAMs) as part of their overall management, however, these options were often not addressed or quickly dismissed. Patients had variable preferences with respect to the amount and types of treatment related information they received. Some preferred to know all the possible types of treatment options, while others believed that the doctors would make the best decision for them. Patients expressed feeling frustrated and stressed by the supposedly well-intended opinions of relatives, friends, and strangers who did not understand that there was no cure for their eczema, yet still continued to provide advice. Patients also expressed that they appreciated the concern shown by their healthcare professionals, and also the opportunity to talk about their eczema exacerbations and how to prevent them. Some patients had difficulties coping with the unsightly rashes on visible areas of the body, such as the face, arms and legs. Both patients and healthcare professionals agreed that having support groups for AD patients is essential for enabling them to share their challenges and provide support for one another. Due to the chronic nature and impact of AD on patients’ physical and psychosocial health, education is critical to ensure successful long-term management of the disease and adherence to treatment. Barbarot and colleagues  emphasised the importance of tailoring AD education programmes to the sociocultural context of the patient. 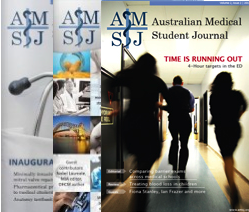 In this study, we have explored the education needs of patients with AD in an Asian context. Both patients and healthcare professionals expressed two main components pertinent in AD counselling, which were knowledge about AD, and coping with the psychosocial aspects of the disease. Although both patients and healthcare professionals agreed that providing knowledge on the pathophysiology of AD was important, patients wanted to know more about the different subtypes of AD and severities, which contrasted with healthcare professionals believing that providing only basic information relating to AD was sufficient. Patients felt that this knowledge could help them manage an impending exacerbation when, for example, they noticed subtle changes in their skin condition. Although the majority of patients in this study felt that they wanted more information on their disease, one patient also acknowledged that having more knowledge might generate unnecessary worry and could therefore have a negative impact. Hence, it is important to tailor the amount and type of information provided to the needs of the patient. Healthcare professionals tend to emphasise the use of moisturisers and topical steroids in the management of AD, which plays a large role in nurse-led eczema counselling programmes [7,9]. However, patients did not feel that they needed more information on the use of topical treatments, possibly indicating that sufficient information is already being provided in this respect. Regarding medical treatments, patients expressed that they wanted healthcare professionals to be more open to discussions surrounding CAMs, and not simply discount them as unscientific or ineffective. A recent study also described that the majority of patients rated it as being important that healthcare professionals know about CAMs for the treatment of AD . Education and counselling regarding CAMs may prove to be an important part of patient counselling, particularly when considering the chronic nature of AD and the limitations of current therapies . It has also been found that in addition to their prescribed therapies, patients who were more familiar with the Internet were likely to search for alternative complementary therapies online, including homoeopathy, ingestion of essential fatty acids, Chinese herbal therapy, phytotherapy, acupuncture, autologous blood therapy, and bioresonance . Small trials have shown that these therapies may have some positive effects, but the evidence is not yet sufficient to support their use . Despite the lack of scientific and clinical evidence supporting the effectiveness of CAMs, healthcare professionals need to be able to address these issues with their patients. Symptomatic itch was a major concern for all patients included in this study, and they expressed a desire for more information relating to its management. Although patients knew that they should not scratch their skin as it would worsen their AD, many found this hard to avoid. This highlights the importance of including itch management as an important component in AD counselling. Besides antihistamines, the current first-line therapy for controlling itch (which is often unsuccessful), patients could be taught to use distraction and habit reversal techniques . Both healthcare professionals and patients agreed that having a support group could be a platform for patients to share their AD coping methods. Weber and colleagues  found that support groups helped improve patients’ quality of life, personal relationships, and participation in leisure activities. The impact of AD on body image has been documented in the literature . As a result of impaired socialisation secondary to changes in body image, support groups could provide a platform for overcoming these issues. Participants also found it stressful and frustrating to receive advice from relatives and friends who did not have much knowledge relating to AD. It was reported by the study participants that most people believed that the rashes were caused by a food allergy, and told them to avoid certain foods, or tried to provide suggestions to cure their AD which did not have any effect. The participants in this study were all adults above 21 years of age, which meant that they were now unlikely to outgrow their disease. On a community level, there could be more education on the various types of skin rashes and the possibility of AD continuing into adulthood. A cross-sectional study was conducted, and therefore we do not know the changes in the needs and coping of patients over time. Also, the experiences of the participants relating to their initial diagnosis was based on recall, which may be inaccurate or subject to bias. Itch management and management of exacerbations are essential for helping AD patients cope with their disease. AD is a chronic skin condition with no cure. Hence, it is common for patients to seek alternate methods of treatment, and therefore CAMs are widely used. Furthermore, people who are more familiar with the Internet could search for information on these therapies online . Healthcare professionals need to be able to discuss the use of these therapies with patients, including explaining that while there may not be any evidence to support their use, CAMs may be used if the components of the therapy are identified and not known to cause any serious adverse effects. Support groups could be used to help patients cope with the psychosocial aspects of their disease. Patients may also benefit from support in managing the stress and frustration arising from well-intentioned, but unhelpful comments from family members and friends. This study highlighted some conflicts in the perceived information requirements of AD patients and healthcare professionals. Most patients wanted more information on the nature of AD, which healthcare professionals believed was unnecessary. For treatments, besides the use of topical steroids and moisturisers, patients wanted more information on CAMs, which healthcare professionals did not believe were beneficial or useful. Despite the lack of scientific and clinical evidence to support the effectiveness of CAMs, healthcare professionals need to have a basic knowledge on these therapies as the discussion of such therapies was important to patients. With respect to psychosocial issues, patients could be taught how to cope with the changes in appearance associated with AD, and the stress and frustration arising from the advice given by their family and friends. A counselling programme should be developed to address these patient needs. The study was funded by National Healthcare Group – Health Outcomes and Medical Education Research (NHG-HOMER) grant (FY15/A02). The authors would like to thank the participants in the study for their time and input. Goon T, Goh C, Yong A. Endogenous eczema. In: Chua S, Goh C, Ng S, Tan S, editors. Asian skin: a reference color atlas of dermatology and venereology. 2nd ed. Singapore: McGraw-Hill Education (Asia); 2015. Lincoln Y, Guba E. Naturalistic inquiry (Vol. 75). Beverly Hills, CA: Sage; 1984. Polit D, Beck C. Essentials of nursing research: appraising evidence for nursing practice. United States: Lippincott Williams & Wilkins; 2013. Macnee C, McCabe S. Understanding nursing research: using research in evidence-based practice. United States: Lippincott Williams & Wilkins; 2008.